Huge Savings Item! Free Shipping Included! 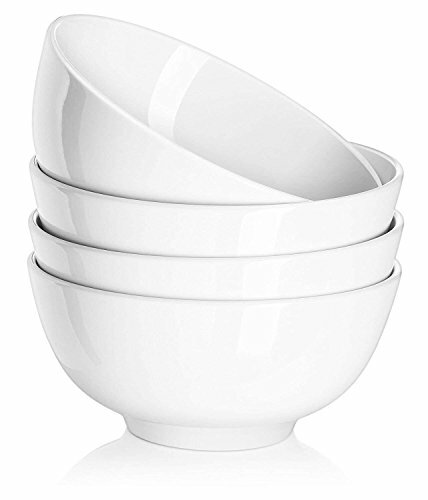 Save 13% on the DOWAN 22oz Porcelain Soup/Cereal Bowls - 4 Packs, White by DOWAN at Foom App. MPN: 010101160408020. Hurry! Limited time offer. Offer valid only while supplies last. DOWAN Healthy Porcelain: FDA approved (LEAD &CADMIUM FREE). Microwave, oven, freezer and dishwasher safe. Classic Round Design: highly stackable to save cupboard space, while easy coordinate with your other dinnerware. Sturdy & Durable: fired at high temperature to maximize the strength (resistant against scratch, breakage and chips), can be used for years over years on a daily basis. Suitable For: family dinner, food storage, breakfast cereal, restaurant serving, party sauce/dipping, holiday gifts/promotions, home decoration and DIY material. 30 DAY MONEY BACK GUARANTEE - Please feel free to contact us if you receive a damaged or defective item.